I have a secret to confess. Carrot cake is my weakness when it comes to dessert. It’s so easy to talk myself into having a slice (or three!) I mean, there are carrots in it, so it’s practically a salad right? RIGHT?! Luckily, it’s pretty easy to make carrot cake healthy. It’s even easier if you throw everything into a blender and make a Carrot Cake Smoothie! This is dessert for breakfast, my friends. What better way to start your day then with a perfectly spiced creamy Carrot Cake Smoothie topped with Sweet Lemon Cashew Cream? This Carrot Cake Smoothie is a healthy breakfast option you can feel good about. Fresh carrots and carrot juice offer beta-carotene. Chia seeds lend fiber and Omega-3 fatty acids and pecans have over 19 vitamins and minerals! So what are you waiting for? 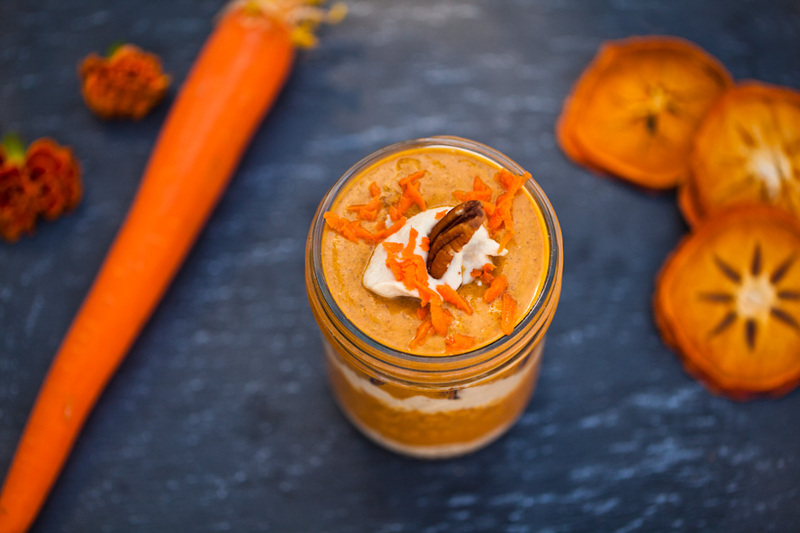 Make this Carrot Cake Smoothie today! Dessert for breakfast, carrot cake smoothie style. It's like cake in a glass but good for you! Topped with sweet lemon cashew cream for extra yumz. Blend all ingredients for 1-2 minutes until smooth. Top with more pecans and coconut cream or a dollop of sweet lemon cashew cream. Soak the cashews for 2 hours or overnight then drain. Combine the cashews and remaining ingredients in a high powered blender or food processor. Process for 1-2 minutes until creamy. *Boil the cashews for 10 minutes to soften if you're short on time (won't be raw). *Will keep for 4-5 days in a closed container in the fridge. Did you make this Carrot Cake Smoothie? Leave us a comment and tell us about it! Or post a photo of your creation on Instagram with the tag #carrotsandflowers 🙂 It will make our day! If you eating cake and having healthy desserts for breakfast, be sure to check out our Raw Vegan Chocolate Shake and our Blueberry Cobbler Smoothie. Did you enjoy this Carrot Cake Smoothie recipe? Pin this photo to save it for later! Don’t forget to follow us on Facebook, Instagram, and Pinterest to stay in touch! I am a carrot cake junkie to and this looks like a yummy way to have ahem’ my cake and drink it too. You mention chia seeds but they aren’t in the list of ingredients. It looks delicious though, I must try this with or without chia seeds. I made this for breakfast and wow, it’s fabulous!!! I swapped out the agave for pure maple syrup and used macadamia nuts instead of cashews, and added a small chunk of ginger as well. The lemon cream is so scrumptious I could have eaten it all right out of the blender, lol! Thanks for the recipe!